What can I do when the GRAITEC license fails to activate by internet on Windows Vista? Possible cause: After choosing to activate the GRAITEC license by internet, the client operating system automatically checks for the server certificate revocation list, while the Certifying Authority for GRAITEC license server (Thawte / Verisign) does not provide such a list. The result is that the client operating system will refuse the connection to the GRAITEC server and the license activation is not performed. For Windows Vista, this option is checked by default (enabled), while for Windows XP it is not checked. 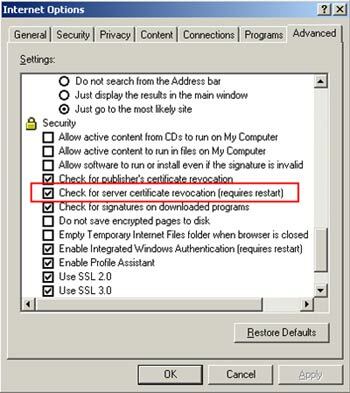 As a result, Windows Vista automatically checks for the server certificate revocation when the client application tries to connect to a certified web server. In the case of GRAITEC License Activation by internet, the License Wizard tries to access the GRAITEC license server (which is a certified server). For the Windows Vista operating systems, the client web browser will automatically check at the Certifying Authority (Thawte / Verisign in our case) that the current certificate was not revoked in the meanwhile. If the Certifying Authority does not provide such a revocation list or cannot be accessed for some reason the client will refuse to connect to the server. 1. Disable the option "Check for Server Certificate Revocation". 2. Manually download and install on the Client computer the certificate revocation list.